Harmon Field was created with support from the philanthropic Harmon Foundation, 1927. State law mandated that it be segregated, it was for African Americans only until 1964. 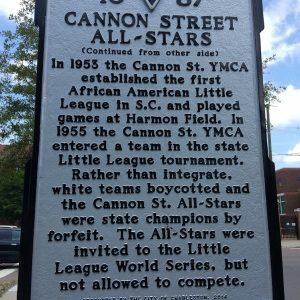 In 1953, the Cannon St. YMCA established the first black Little League in SC, it played games here. The YMCA entered a team in the state Little League tournament, 1955. White teams boycotted rather than integrate, the Cannon St. All-Stars became state champions by forfeit. The team was invited to the Little League World Series, but not allowed to compete. The state marker is on the President St. side.